Put a small upward bend in the ends of control wires for the rudder and elevator, where you trimmed them off. Allow for some adjustment but the bend will catch the wire if the linkage stoppers come undone for any reason. That way you will have a little control. Good to see it coming together! I can't wait to maiden it! My FliteTest order came yesterday! I finished wiring the wing last light(I'll post pictures later). I hope it will fly! Have you hooked up the receiver and powered anything on yet? Yes, I did. Everything works. Don’t forget to set all the throws and add 30% expo, plus check the CG is right. Time spent sorting that stuff on the ground will save time spent hugging trees, kissing dirt and fixing planes. Thats great. Good job. Cant wait to see the maiden video. I just finished plugging everything in to the receiver and putting the wing on. I have a little problem, When I do the throttle, one motor starts before the other motor. Do you think it is because I have different size ESC's? All you have to do is calibrate the esc's. #1. Take off you props. #2. Power on your transmitter. #3. Set your throttle to max. #4. Plug in your airplane battery. #5. After you hear a tone come from the esc's lower your throttle to the bottom. That should be it make sure you do this with your props off. Ok, I'll try it! Thanks! I use those same 1806 motors on 20amp esc's on 3s. 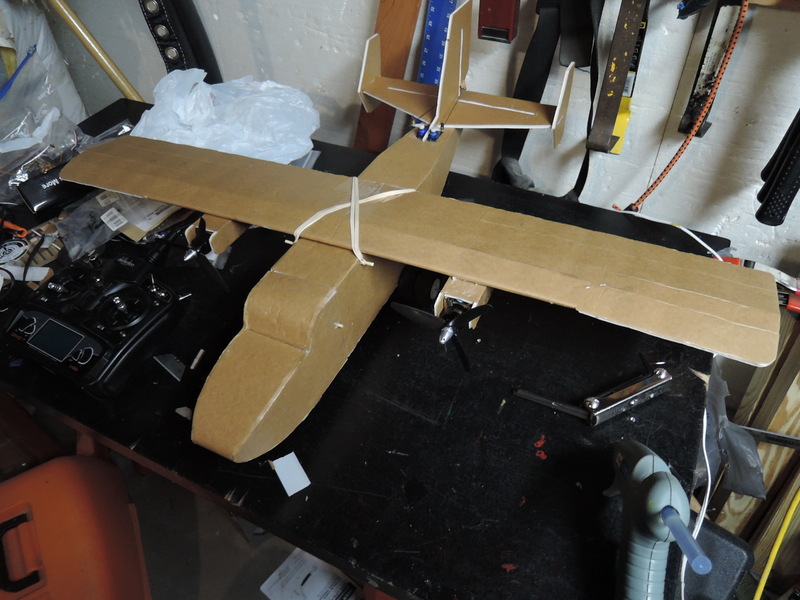 I originally wanted the torque and look of a 4 blade prop so I went with 5x4x4 props. Let's just say it was amazing. Unlimited vertical with about 75% throttle. It went from hand launched speed to full speed in about 1 second. But I have since switched to some 6x3 2blade props to increase efficiency. Went from about 10minute flights to about 15minutes using a 1300 3s. Fast forward a few months and I my need to drop stuff 😋, I added a servo to the rear door. Bad idea. The amp draw from the 5 servos was to much for the 2a BEC that was on my 20amp esc's. It was fine on the ground but when it was in the air and the servos had loads on them, when I opened the cargo door my Rx would brown out and... Well, you get the picture. Rebuilding now and I am switching out my 20a esc's with built in BEC with two racerstar 12a esc's with no BEC. I am using a 5a UBEC, basically it's an external BEC to power the RX and servos. So, the BEC is also called a battery eleminator circuit. It takes the 12v your battery has and cuts it down to 5v to power your Rx and servos that all use 5v. They are all rated differently, some have 2amps, some have 3 or 4 or even 5amps. Generally, the bigger the esc, the more amperage the BEC will provide. Now, with this in mind, if your 20amp esc has a 2amp BEC on it, the rule of thumb is .5amps per servo. Meaning each servo will draw .5amps from your BEC. Also meaning you can power 4 servos with your 2amp BEC. Just like I did. I was fine till I added that 5th servo. And again, on the ground testing it it will seem fine. But in the air, when the servos are fighting the airflow and have loads on them, you could have brown outs, like I did... Lol A brown out is when you over load the BEC that is giving power to your Rx, and your Rx can't draw enough power to work, and it will power off. If your lucky, you will be high enough and when the load drops on the servos the RX will power back on and hopefully you wouldn't crash. I was able to get back up twice, but that 3rd time got me. Ok, long story short, look into what esc you have powering your Rx with, see what amperage it is rated for, probably 2amps but it could be 3amp. Do your math. If it's 2amps and you have 5 servos, you run the risk of brown outs like I did. If it's 3amp BEC, then you should, in theory, be fine. Good luck with the maiden!! I tried what you said but it didn't work. I have to plug the battery in before turning on the transmitter or else it won't bind. You should only have to bind it once. Once it's bound it should auto connect from then on. Youve got be able to calibrate the ESC's. Really? Well, it doesn't connect unless I plug in the battery first, and then turn on the transmitter. Thats not right, the transmitter should be on first, and then you plug in the battery.